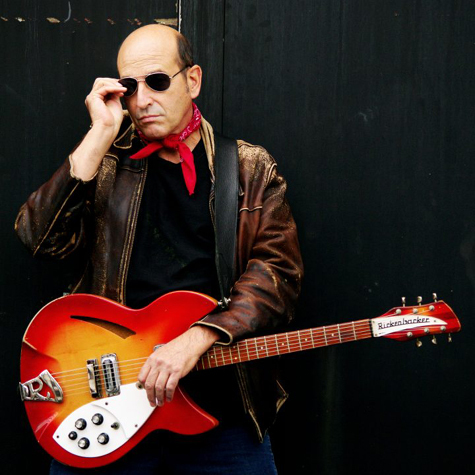 From his earliest days as the drummer for influential L A pop band The Nerves ("Hangin' on the Telephone"), musician Paul Collins has gone from strength to strength. Following his stint in The Nerves, Collins would form power pop legends The Beat (whose debut album featured the Collins-penned classic, "Rock N Roll Girl"), as well as the equally influential Breakaways. Now into his 25th year - and counting - as a solo artist, Collins continues to lend his era-defining presence to some of the most indelible pop music of the last 40 years. From Poptopia: Power Pop hits of the 70s to D I Y: Come Out And Play: American Power Pop, you won't find a power pop compilation in existence that doesn't feature at least one Paul Collins performance (in the case of D I Y: Come Out And Play make that two!). As the title of Mr. Collins' 2010 CD release proclaims, he is the King of Power Pop. Recently, Mr. Collins sat down with to talk about his life as a working musician. PSF: You've been playing music professionally since 1974. 43 years. Was there a key moment for you in those early years, when everything seemed to fall into place and you knew you would make your living as a musician? Paul Collins: That really came later on for me. In The Nerves, we were kids and money didn't seem to matter. The Beat got signed to a major so we had all the money we wanted. It was only until much later on that the problem of supporting myself became an issue. It was a long haul from 2008 when I was practically broke 'til today where I can safely say that I support myself with my music. And that is 100% thanks to the DIY ethic. PSF: Mentioning the D. I.Y. "ethic," it's interesting to note that 1993's influential power pop compilation,D.I.Y. : Come Out and Play: American Power Pop (1975 - 78), features two Nerves songs, as well as a photo of the band gracing the CD cover. What does D.I.Y. mean to you as a musician. A state of mind? A work ethic? An attitude? PC: D.I.Y. means exactly that you do it all yourself, usually because no one else will do it for you, so you have the choice of getting out there and making something happen or sitting alone at home and doing nothing. Then after doing that for years you realize that you can actually do it better than most people will because you have learned by trial and error how it's done and you know that when you are making your plans that it's you that will actually have to go out there and do it! PSF: Your first band, The Nerves - you on drums, Jack Lee on guitar, Peter Case on bass - formed in Los Angeles in 1974. Despite the band's short lifespan (1974 - 1978), The Nerves managed to release a self-titled EP in 1976 which, to this day, stands as one of the undisputed classics of the musical genre known as power pop. What comes to mind when you think back to that era? PC: The Nerves was my first real band and it set the tone for what would follow for me. I learned a lot about music and the music business in that band. As a songwriter, I could not have asked for two better teachers than Jack Lee and Peter Case. The lessons I learned I latter applied to my next group, The Beat, and to this day I try to apply all the wonderful things I learned way back then. I also remember that is was an uphill battle back then and we didn't really have a lot of support, we operated mostly on our own. I am not sure why, it could have been because we were living in San Francisco and we all came from different parts of the country so we didn't really have a lot of friends. When we started out the new music scene had yet to begin so there was nothing really for us to attach ourselves too. For whatever reason it seemed like the band was destined to crash and burn, but it make quite a racket! PSF: Given the musical pedigree of The Nerves EP, and its anglophile leanings, would it be safe to assume that the music of The British Invasion was an influence on you and the other members of the band? PC: We were big fans of The Beatles and The Rolling Stones and also of the whole Mersey Beat sound. We used to play “Ferry Across The Mersey" by Gerry and The Pacemakers when we first started out. We would listen to all the groups from the late fifties and the early sixties. Anyone who had a good song, we would listen. PSF: You were the drummer in The Nerves, but after The Nerves split, you switched to guitar. In your musical education, which did you pick up first: drums or guitar? PC: I began by playing the drums. My first kit was a Remo snare drum which I added a foot operated garbage can and a few pots and pans. That was my first drum kit. Later on, my mom got me both piano lessons and folk guitar lessons. The folk guitar lessons would prove to be the most valuable for me. My rhythm style became a synthesis of my drumming and those folk chords I had learned. PSF: Who were some of your influences specifically as a guitar player? PC: I always loved The Beatles and The Stones. After that, it was all the great music of the late fifties and the sixties and the seventies right up until the early eighties. I lost interest after punk and new wave. My guitar style is all my own I didn't really have any particular player that I wanted to copy. That might be due to that fact that rhythm guitar is usually in the background. PSF: When you say that your rhythm style became a" synthesis of my drumming and those folk (guitar) chords I learned," I'm reminded of Foo Fighters' front man, Dave Grohl - who, like yourself, is proficient on both guitar and drums - and once remarked to a journalist, “The way I look at a guitar is like a drum set ; I look at the lower strings like they're kicks and snares, and I look at (the higher strings) like they're cymbals. So, when I play, it's almost like a (drum) pattern..." I would imagine you're both saying essentially the same thing. PC: No, I didn't and don't look at it the same way. I started playing the drums because I wanted to play music at any cost and the drums was something I could do without any training. Later, my mom got me folk guitar lessons so I learned the basic folk chords which became the basis of my rhythm guitar style. I just blended my bare bones approach to drums with my very basic guitar style. When The Nerves broke up and I really started to write songs, it became harder and harder to that from behind the kit so I switched to playing guitar full time. PSF: On The Nerves 1976 EP, Nerves, songwriting duties seemed pretty evenly split among the band members: Jack Lee wrote two tracks, you and Peter Case one each. By the time The Beat released their debut album in 1979, all 13 tracks were Paul Collins compositions." Walking Out on Love," "Rock N Roll Girl" and "Don't Wait Up For Me" in particular are acknowledged pop classics. Did you first try your hand at songwriting as a member of The Nerves, or had you been writing before that band? PC: When I joined The Nerves, and saw how Jack and Peter were writing such cool songs I had to try and do it myself. It took me a full two years of trying practically everyday until I came up with my first two songs, “You Won't Be Happy" and “Working Too Hard." PSF: I've read that Greg Shaw - founder of Bomp! magazine - played a significant role in The Nerves career trajectory. How did that come about? PC: The Nerves were selling everything we owned at The Hollywood Swap meet but no one was buying a thing! It was hot as hell and we were standing there in our three piece suits, sweating like pigs. This young guy come up to us with a paisley shirt, white jeans and his Dutch Boy blond hair cut and a big smile on his happy face. He says "Hi I'm Greg Shaw and I want to buy 800 copies of your 45!“ That's how we financed our one and only tour! PSF: You mention having applied what you learned from your time in The Nerves to your next band, The Beat, formed in 1979 -- something All Music Guide noted in their review of the band's '79 self -titled debut:" The Beat proves that Paul Collins learned his lessons well from his tenure with pioneering L.A. popmeisters The Nerves" The review goes on to hail the album as "a minor classic of late-'70s power pop." Power Pop seems to be the defining label when describing the music you've made - and continue to make to this day. But is that a fair assessment of the music itself? When I listen to The Beat, I find there's an underlying toughness to the music that recalls - in a good way - the grit of the early Punk bands. PC: Power pop wasn't the most helpful tag for us. In the first place, it kept us off the radio. Radio back then was not going to play power pop in any way, shape or form. “That's What I like About You" and “My Sharona" were the two exceptions. In our opinion, we played rock n roll and we looked at power pop as more of hindrance than a help. It sounded wimpy to us and we definitely didn't think we were playing wimpy music, in The Nerves or The Beat. It kept us apart from the rest of our contemporaries in the rock n roll world that were getting radio play, like The Police, Tom Petty, Elvis Costello and so forth. Today, it has a more positive spin, the kids embrace it and thanks to the internet, it is more than likely more popular now than it was back then. I guess you can say it accurately describes the kind of music we play, short songs about girls, love, travel and work with great hooks and harmonies. One thing is for sure- it is a very much-maligned genre of rock n roll that still has a very limited audience. I would also say that the lines between punk and power pop have blurred considerably since back in those days. Nowadays, you will see a mix of punk and power pop and new wave fans at the shows. That, for us, is a good thing. PSF: Whereas the impression seems to be that The Nerves were more or less made up of three equal voices, judging by the cover of The Beat -where you appear front and center, your band mates in formation a few respectful steps behind - I would guess you'd taken something of a leadership role in that group? PC: The Nerves was undoubtedly a band, all for one and one for all, in every single thing we did. It didn't matter that I was the youngest and the baby of the group or that Jack was the oldest and the leader of the band. That's why in a way it made such an impact on me. That's what I had always wanted, a real band where everyone had an equal say. It's as close as I could think of what it would have been like to be in The Beatles. The Beat on the other hand was different. Steven Huff and I were the ones who put that band together and so naturally there wasn't that unanimity in the band. Also, we were managed by Bill Graham and on Columbia Records. Those two companies really started to push us around and they wanted to establish me as the leader and the band as just the band. To that end, they only really signed me and the band was payed as union sidemen. It was just one more example of how the industry messed up rock n roll bands. They liked the divide and conquer approach. Had we not been signed to a major, we probably would have presented ourselves more as an equal band. But really in truth, we weren't a band in the same way The Nerves were. PSF: You and bassist Steven Huff put the Beat together. How did Michael Ruiz (drums) and Larry Whitman (lead guitar) enter the picture? PC: Steve and I had been recording The Beat demo at his house over in Silverlake (Los Angeles) for about a year. We ran into Michael Ruiz and he came by the house to lay down some drum tracks. We hit it off with Michael and we loved the way he played. Mike told us about the guy he knew, Larry Whitman. They had done some things together and he thought Larry would be perfect, and he was! Things moved really fast at that point and before we knew it, we were auditioning for CBS Records at The Masque! PSF: I watched a concert film of The Beat performing at Berkeley Community Theater in 1980. Whether or not this is the entire concert, what I saw is a good 50 minutes of high-energy rock and roll that never once let's up. In particular, you yourself go beyond high-energy to what I would call high-voltage while on stage. It's a mesmerizing performance, and I wonder what your memories of that evening are. Although I don't recall many crowd shots in the film, I'm quite sure the audience was feeding off your energy and having the times of their lives. PC: It's great that there is that document of the band performing live. My memories of the show itself are blurry but I do remember being excited to play such a big theater. We were ready to move into the bigger venues and that footage is proof of that. The band was a well-oiled machine by that point. We should have kept touring, we should have toured extensively and really sealed the deal for ourselves by really building a big fan base... but we didn't... thanks to the plans our management made for us. The Beat was a really good band live, we had all the right ingredients, the combination of the songs and my delivery with Larry Whitman's screaming guitar sound and Steve Huff's rock solid bass and Mike Ruiz's inventive drumming made it all click in a big way. PSF: How much of the year do you typically spend touring? PC: Until recently, it seemed like I was always on the road, I would do some 80 to 90 shows a year, which is a lot when you are doing all the bookings yourself! I took a break after my last tour of Europe, last May. I did 30 shows pretty much back to back in as many cities in about 8 different countries. I did it all on my own- it was my first totally solo tour. It was great but it took a lot out of me! I got it down to the bare essentials- just me, my guitar and two suitcases, one for my clothes and one for the merch! It was pretty cool though, I did most of it by train which was very cool and very relaxing. Since the trains in Europe run on time, it also meant that I got to spend more time at the hotel relaxing than ever before! PSF: I met you when you payed Birmingham, AL in 2014 - great show, by the way. At the time, you were developing a truly unique" business model" - an approach to touring, merchandising, generating interest/business for local bands in the different towns where Paul Collins Beat might be playing on any given night - which I found quite fascinating. I believe it was called “Garageland." PC: Garageland unfortunately never got off the ground, it was a good idea but just too difficult to execute. In the end, I wound up doing tours with the record fair concept which worked pretty good in a lot of places. The concept was simple, we would invite a local record store to come to the show with a few crates of vintage rock records and have a record fair/happy hour before the first set, the idea was to try and get folks to the show earlier. PSF: The “Record Fair Concept"- what is that, exactly? PC: I was touring endlessly, crisscrossing America DIY-style, playing all the usual clubs with all sorts of bands and every night (and) it was the same problem. How can you get people to come to the show early enough so that all the bands get to play in front of a crowd and the show can start on time. I came up with what I thought could be a great idea- the record fair/happy hour to start the show. It would combine what everyone loves about rock 'n' Roll- vinyl and booze! It worked great and with the added bonus of involving a local record store, it really became a community event. The stores loved it as it was a great way for them to connect with their local customers and young and old folks dug it too. It was a win/win situation! I made a lot of friends with a lot of stores! PSF: When not on the road performing, are you generally working on new material? PC: Writing songs is a lifelong job. It never ends. I am always on the lookout for a new song. It's the most challenging thing in my life and it has been since the very start, I hope I can always be part of songwriting as it's so exciting to come up with a new song! PSF: What can fans expect to see in the coming year from Paul Collins' Beat? Is there a new album on the horizons? PC: Coincidently, I have just finished my latest recording, I think it's my 13th studio album. I am both excited and nervous, as always, one never knows how good it really is until some time has passed and everyone including myself has had a chance to live with the songs and the way they came out in the recording. The title of the record is In and Out of My Head. We did ourselves so I hope to find a good record label to put it out. It's a never-ending job, but I love it! In and Out of My Head is out September, 2018 on Alive Natural Sounds!